Just to refresh your mind on my previous post about the Trek’s Flucard Wireless SD, I am going to introduce now the Flucard complementary invention called “Ai- Ball”, is a device capable of recording both video and audio remotely thru wireless signal. Ai-Ball was officially announced by Trek and Toshiba in the Press Release held at Singapore. You can also read the whole article here. Ai-ball is almost a Singpore 50-cent coin in size but it can do continuous streaming up to 20 meters wirelessly with 2MP built-in camera. The device is powered by CR2 batteries that last up to 1.5 hours viewing and capturing. Also can AV recording thru PC. Phones, iPads (No installation software needed, no cables required). 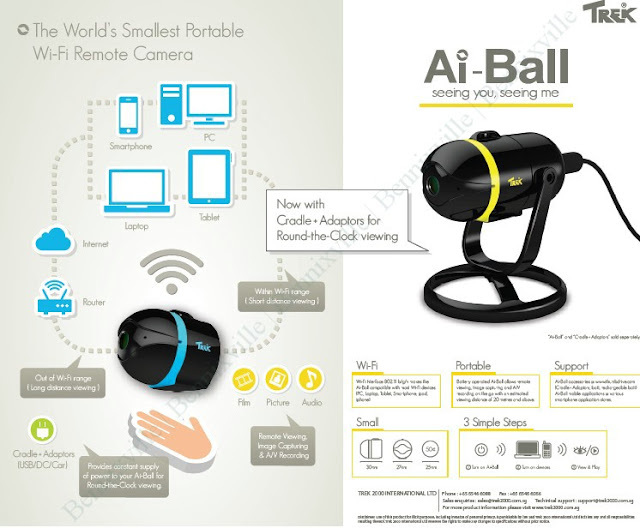 Ai-Ball was known now as the world’s smallest portable remote Wi-Fi camera and Trek really hoping that this innovation would come across with range of commercial industries someday. worth S$119. I will give you soon the price update. For more information, visit our website at http://www.trek2000.com.sg, http://www.thumbdrive.com andhttp://www.flu-card.com.